Blossom's music exuded a sparkling kind of elegance and quick wit. Hers was the kind of jazz you could imagine in the really good Woody Allen movies. She was the Dorothy Parker of jazz. 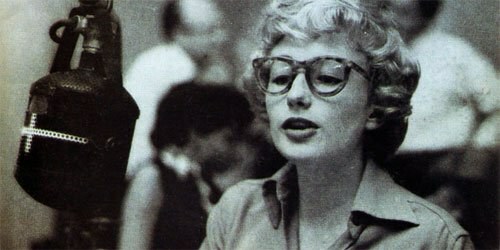 Blossom Dearie, the inimitable jazz singer with the little girl voice, died in early February of this year. Blossom—as I'll always think of her, so perfect a name it was for her instrument—was a specific treasure. To me, she was as great a jazz singer as any of the divas of the music. Ella and Sarah and Billie, all were vastly greater talents than Blossom. But Blossom swung as hard—if effortlessly—and was just as much herself along the way. That voice—light and undersung and the very sound of old-fashioned youth—still makes me think of nearly everything I love about music. Blossom Dearie was born in 1924 in East Durham, New York, and she came of age as a singer and pianist in the '50s, a time when the hippest music in America wasn't far off from the supper clubs and cabarets—a kind of "indie" music for its time. Blossom, a preppy-looking white woman with a sound that was the very opposite of "down home", shared a social and music scene with the likes of Miles Davis, the baddest and hippest jazz musician on the planet. Her career boomed, artistically and commercially, in the '60s, and whether through cleverness or pugnacity she made few commercial compromises as the decades passed. She appeared on television singing great songs because the hosts were charmed by her. Her career was inadvertently boosted by the success of a jingle she recorded for Hires Root Beer in 1962, leading to the release of Blossom Dearie Sings Rootin' Songs, but her art was essentially untouched. In the '70s, she recorded some pop songs associated with the singer-songwriter movement ("Killing Me Softly" and "Both Sides Now") to no real ill effect—at the same time doing more composing herself. She also helped out her pal Bob Dorough by doing some cameo singing for his work on the kids' show Schoolhouse Rock. She was open-minded, but she knew what she wanted in her art. This was clear in the '70s, a time when Blossom became a true pioneer by founding her own record label. On Daffodil Records, she could produce and release music to her own specifications. These records, which sometimes featured an electric piano, were the very opposite of commercial calculation. With the exception of her very first recordings on Verve in the late '50s, these are her finest moments in the studio. Blossom continued to record and perform in New York into the new century, even recording a song, "It's Alright to Be Afraid", for the victims of the World Trade Center bombing. She was a regular in Manhattan and European "supper clubs" and cabaret rooms up until 2007. Her voice, described as a "teapot voice" that "could not reach the second floor of a dollhouse" never really changed significantly—nearly to the end she maintained a hip, sharp way with her charming, purring throat. She died in her sleep from natural causes in her Greenwich Village apartment on 7 February 2009. It seemed perfectly appropriate that I learned of Blossom's death inadvertently, just by clicking a link on a web page. I discovered her the same random way. When I was discovering jazz as a teenager in the early '70s, I rarely listened to my parents LPs. They owned some Sinatra classics that I was too dumb to appreciate, and I also recall the Nancy Wilson albums that were stacked next to the turntable. One day, flipping through what I thought was a pretty un-hip collection, I found Blossom Dearie, her very first American recording for Verve. The cover was hardly promising: a young woman in thick, Woody Allen-ish glasses and a '50s hair-do, looking up toward a microphone while sitting at a piano. Who is this "Blossom Dearie?" I wondered. But if she's playing with the likes of Ray Brown, Herb Ellis and Jo Jones, then she must be good. I found out quick enough that this lady—who looked just enough like a blonde version of my mother, circa 1956 or so—could sing, sure, but she could also play. Blossom was a pianist, and by direct evidence, an accomplished and interesting one. Though her touch was light and "feminine", her harmonic imagination was bold. She sounded, in fact, not a little like Miles Davis' great pianist from that era, Bill Evans. And like Evans, Blossom was an outstanding accompanist—of herself. From the first notes of "'Deed I Do" ("Do I want you? Oh, my, do I. Honey ... 'deed I do"), my ears were in handcuffs. Here was a jazz singer lacking all the usual histrionic business. No trills or swoops or over-drama. No grunting or fake authenticity, but also no sentimentality or cheesiness. And you can hear a twinkle in her phrasing that acknowledges the cleverness and irony in the words. Later, when the lyrics rhymes, "For, heaven rest us / I'm not asbestos! ", Blossom makes the ingenious lyric seems not precious but a thrill. But when she finally sings, "I know that music leads the way to romance / So if I hold you in arms I won't dance", it's clear that what she's finally saying is—when you hold me in your arms I'll do way more than dance. All this is clear because in Blossom's voice there is the surface sound of innocence—a little girl tone and pitch—that is Turned Just So into experience by the way Blossom places her syllables against the beat. It's not an obvious thing, but it is a very effective thing: Blossom swings her little girl voice in a way that makes clear that she is no little girl. And so, like the aftertaste of a great glass of wine, her voice becomes impossibly powerful through an act of implication and subtlety. From that point forward, I loved Blossom Dearie. Beyond the confines of my living room, Blossom Dearie had a passionate following. Miles Davis was a huge Blossom fan and allegedy joked that she was "the only white woman who ever had soul". Davis and Dearie shared a delicacy of approach but also a vicious sense of rhythm. No wonder they dug each other. They also shared a home, New York City, and the each embodied it in a way. Blossom's music exuded a sparkling kind of elegance—not heavy "sophistication" but rather quick wit. Hers was the kind of jazz you could imagine in the really good Woody Allen movies. She was the Dorothy Parker of jazz. Blossom chose repertoire with true élan. She was the earliest champion of the hilarious but complex songwriting of Dave Frishberg, and her versions of his songs "I'm Hip" and "Peel Me a Grape" are definitive. In the former, she personifies a self-satisfied—but deluded—member of the hip-gousie, someone who admits, "I even call my girlfriend 'Man', I'm so hip". In the latter, she is a manipulative woman who implores her man, "Best way to cheer me: cashmere me". Only Blossom's version of "Grape" rings fully true because her cutesy-pie voice always has a hint of throatiness, and her precise swing phrasing makes clear—Men: watch out. As a result, Blossom became one of the only jazz singers to take on a truly modern persona as a storyteller. She embodied these characters to the point where they seemed to be her. And she also had a kind of "wink" in her voice as she sang these songs. "Am I these people," it seemed to ask, "or am I commenting on these people?" Either way, the performances were riveting. Blossom Dearie's work also had meaning in the cauldron of race and gender matters in American culture. As a white woman who was not only singing but also playing and improvising, she was already a daring figure in the late '50s. But hers was a kind of transgression that did not trade in imitation. She was not a white performer who sounded black such as, arguably, Anita O'Day. And she was a not a woman who was happy to retreat from playing the piano once her singing became the main course (like Sarah Vaughan). Rather, Blossom was a white woman who sang and played just like herself, inhabiting her individual identity and therefore fulfilling the great promise of jazz to strong effect: to find your own voice and use it to bend the material such that your own voice is transformative. In the way she combined clarity of approach with complexity of persona, Blossom was arguably a critical "proto-singer-songwriter." In middle-age during the '70s, she started writing great material of her own. And, intriguingly, several of these tunes—"Sweet Georgie Fame" and "Dusty Springfield"—were written about the power and interest of non-jazz figures. Blossom knew where things were going, as she found an electric instrument that was in sync with her voice (the bell-like Fender Rhodes piano) and she founded her own label to secure the continued production and distribution of her sound. Rather than embodying a mid-20th century romanticism (though she did excel at that), Blossom Dearie exuded independence. For all her accomplishment as a jazz singer and pianist, Blossom Dearie's influence remains hushed. She operated in the same league with other more renowned jazz singers—Sinatra and Nat Cole. Sinatra gets credit for being the band singer who told personal stories, and Cole gets credit for perfecting a kind of witty elegance. Blossom's mark is plain, however, in a critical handful of today's best jazz singers, the ones who put a premium on subtlety. Diana Krall has a husky alto that is a plain contrast to Blossom, yet she has not been shy about making "Peel Me a Grape" one of her signature songs. A less heralded singer, John Pizzarelli, may be even more Blossom-influenced. First, like Dearie, Pizzarelli is an instrumentalist first, a guitarist. His singing is "small" but highly effective—a thin instrument that he employs rhythmically to create swing and cleverness. Like Krall, Pizzarelli has feasted on the Blossom Dearie songbook. In addition to recording "I'm Hip", Pizzarelli often performs the witty "Rhode Island Is Famous For You". And like Blossom, Pizzarelli taps into a vein of humor that updates his swing-based conception. Beyond jazz, traces of Blossom linger. Popular singers such as Joni Mitchell and Norah Jones seem to have absorbed both the wit and the subtlety of her technique. Mitchell's recording of "Twisted" (a vocalese tune by Annie Ross) is positively Blossom-esque, and a heaping dose of Jones's charm is in how she "undersings" her material. Less is more, Blossom teaches, as long as you use each syllable like a quiet knife. But whether other musicians follow in her footsteps or not, Blossom continues to pile up fans. Her appearances in those couple of Schoolhouse Rock songs continue to resonate for younger adults—the song "Figure Eight" appeared in the soundtrack for the movie The Squid and the Whale. And she is a perfect target for remixers who want to contrast a modern groove against a delicate sense of elegance (see the Brazilian Girls' remix of her "Just One of Those Things"). Blossom also appears on a healthy number of compilation discs, including Spring Romance, where her classic version of "They Say It's Spring" appears. Three and a half minutes of easy bliss, this tune projects all of Blossom's strengths: a fresh youthfulness, perfect swing, harmonic ingenuity on the piano, and a subtly dangerous turn of phrasing here and there that reminds you of what really happens in the spring. But no matter how many Starbucks drinkers or Pottery Barn customers find themselves popping their fingers to a Blossom Dearie track, I will always consider her my own singer. Since I held her debut album in my adolescent hands and up through last year, when I taught a 15-year-old singer in my student band how to phrase "If I say do it, jump to it" in "Peel Me a Grape", I've always consider Blossom to be my own personal siren. I suspect that we all feel that way when we hear her voice even now that she is gone. When Blossom Dearie sang, perhaps her voice could not reach the second story of the dollhouse. But it did reach my ear, we think. Her voice is an intimate voice. It's just for me. Blossom Dearie, rest in peace. You sang directly to me, and every note, every syllable, every purring vowel was a thrill. The Hernandez Bros.' Love and Rockets graphic fiction series has created a community of misfits filled with as much anger as warmth, with as many mistakes as wisdom, and with as much sadness as joy. Marq De Villiers' readers will readily discern where -- aside from abysses -- Hell and Damnation: A Sinner's Guide to Eternal Torment is headed: someplace unexpectedly fun. Radical Face issues a thoughtful meditation on the process of getting to know one's self via Therapy and talks about letting go of trauma, the loneliness of knowledge, and what comes next. The exploration of Alex Chilton's recording career and legacy is expanded by Bar/None Records' dual release of From Memphis to New Orleans and Songs from Robin Hood Lane. Cultural and musical variety is the spice of Austin-based Grupo Fantasma's American Music: Volume VII. Kevin Morby's Oh My God is a stunning high-wire act of high-concept and deep-rooted rock and roll at the same time. In 1981, Johnny Mathis cut an album with the Chic Organization. Columbia Records got cold feet and the project was vaulted for nearly four decades. Mathis talks to PopMatters about the missing piece that's finally been made part of his official discography. Today, Jordan Rakei is premiering his latest single "Say Something" and announcing a vast world tour with more US dates to be announced in future for autumn. A recent Live From Here with Chris Thile included guests Gaby Moreno, Cécile McLorin Salvant, Josh Ritter, and some current names on Broadway. While Anthony Asquith's Shooting Stars and Underground look excellent on Kino Lorber's digital restoration, Arthur Robison's The Informer, looks most spectacular, thanks to working from the original negative and a tinted nitrate print. It would seem high time to put together an anthology of literary voices that have been marginalized in the grand tradition of walking. Beneath My Feet: Writers on Walking is not that anthology. As Elva, Elizabeth Morris and Ola Innset's smart and poignant indie pop tackles big ideas with hopeful clarity on Winter Sun. Progressive bluegrass band the Infamous Stringdusters follow up the Grammy-winning Laws of Gravity with Rise Sun, a journey into the light. The latest album from the Chicago jazz trio Typical Sisters is full of understated beauty and unique musical choices. The Irish novelist Sally Rooney centers her drama, Normal People, around the desperations of youth under late-capitalism, but the novel's psychological excavations, nuanced and piercing, owe just as much to the influence of Jane Austen and Virginia Woolf. Wang Chung's Nick Feldman recalls making one of the band's biggest hits, working with one of film's greatest directors, and the future of Wang Chung itself. MetalMatters: April 2019 - It Is April So "Why So Serious?" © 1999-2018 Popmatters.com. All rights reserved. Popmatters is wholly independently owned and operated.